Common snook, AKA Robalo or Linesiders, are native to the waters of the Gulf of Mexico, provided there’s a place for them to avoid wintertime water temperatures less than about 60-degrees F. Big Deal? You say! Actually, it’s a really big deal, as snook are the top of the food chain when it comes to sport fish, but historically have not been found south of Cedar Key, in Levy County, on Florida’s Big Bend. In fact, in the 1980’s, snook pretty much stayed south of Anclote Key, in west central Florida. Of course, time has changed and our climate is definitely warming. 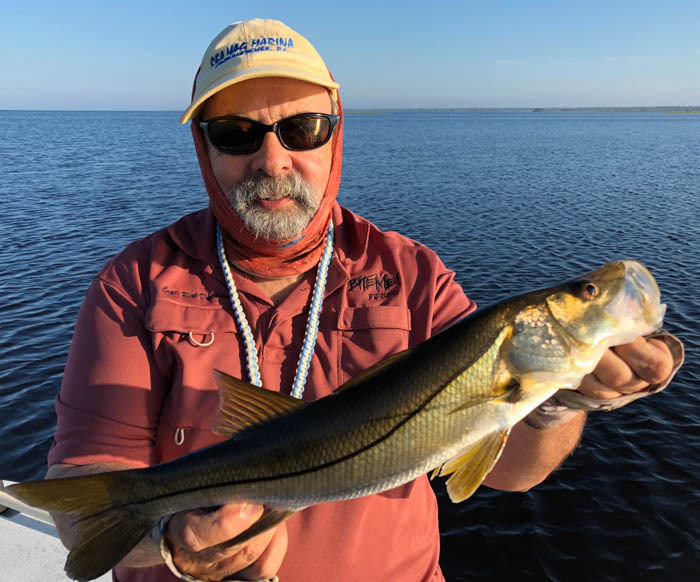 Recent winters are milder, and cold fronts come more slowly during the winter months, giving snook a chance to head to deeper, warmer and more protected waters like springs and deep river channels. 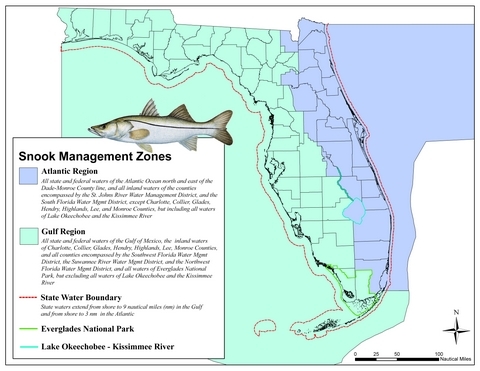 While official snook management zones include the entire Gulf Coast of Florida, the historic range of snook has been south of Tampa Bay. In terms of habitat, snook like structure and moving water. They are the ultimate ambush hunters, often hanging out around rocky points or cruising along man-made jetties, waiting to attack passing bait Good places to begin your snook search are the many rocky spoil islands alongside the Duke Power shipping channel or the spoils alongside the now-defunct Cross Florida Barge Canal, south of Yankeetown. Both ditches were dredged, leaving tons of ragged limestone rock along their edges. Much like those found in deeper inlets and passes to our south, slot-sized snook have been found schooling around nearshore rock piles in 30 to 50-feet, often as by-catch for reef fish anglers. Shown is a keeper snook* from a reef off Cedar Key! Snook caught in the darker, more tannin-stained waters in the northern Big Bend often look gold in color. 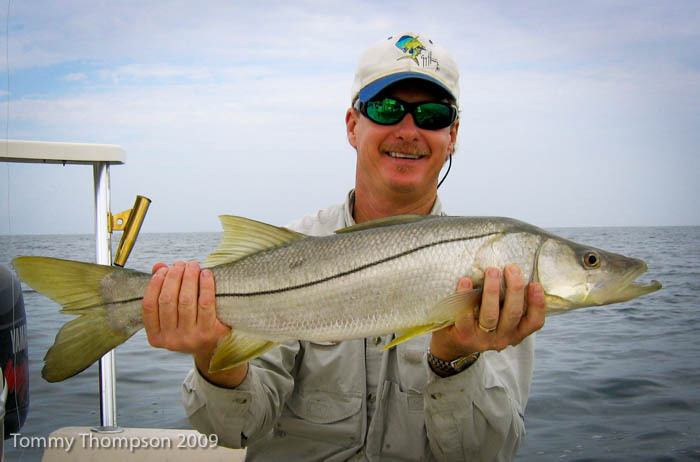 If you don’t regularly target snook, here are a few thoughts on bait and tackle. Snook are equal opportunity eaters. They attack both live and artificial baits with gusto. Live baitfish like pinfish and white bait are excellent, provided they’re hooked in a way allowing them to swim naturally in the current. And if a snook tries to eat your offering, spitting it out “scaled”, put on a fresh one. Live shrimp work well, too, provided they’re jumbo-sized. As for artificials, light-colored jigs, plugs and flies all work well. A free-lined 4-inch D.O.A. shrimp in “glow” is my favorite, followed by a similarly patterned Bait Buster. And don’t overlook the excitement of a vicious snook strike on a topwater plug like a classic red-headed MirrOlure She Dog. Tackle is important, too. Snook have sharp line-cutting gills and rocks are never forgiving, so consider giving yourself an advantage by rigging 40-pound fluorocarbon to the end of 20-pound braided running line on 5000 class spinning tackle.